I am interested in learning to be an organic farmer. I have had some international, organic farming experience in the past (~ 5 years ago) and would really like to make this a full time career for myself. Do you know of any programs that are available to receive this type of training? I have contacted Central Carolina Community College. I am hoping that you may have some other suggestions for schools and/or universities that you can share with me… I am looking for more fulfillment by directly shaping the food system and improving the health of those around me. Please let me know if you have any suggestions. Thanks for your question on organic farmer education. We have many opportunities in WNC and nearby. My first advice to my workers, most of whom are on an organic farmer career path, is “Don’t quit your day job.” Particularly as your farm is in the start-up phase, it takes a while to generate enough net income to cover living expenses. Even established family farms usually have some source of off-farm income. The first step in planning your educational strategy might be to decide how important credentials are to your training objectives. Your education plan could lead to a certificate on up to a graduate degree in sustainable agriculture. Or it could be more informal relying on conferences, seminars and web resources. It could be very hands-on by working or volunteering on local farms. In my opinion the best option might well be an “all of the above” approach that continues as long as you are a farmer. One of the appeals of organic agriculture to me is the endless opportunity to learn. In the space of an hour you can be called on to be supervisor, marketing expert, entomologist, plumber, and electrician. Most organic farms use farm workers at one time or other. These learning opportunities range from full-time room and board situations with a stipend to occasional or seasonal work to volunteer situations. The OGS CRAFT program (tab off the home page) is a great way to connect with successful farmers and to hear first-hand how they run their operations. OGS also works to match farm workers with farmers in need of help. Many organic farmers read the ASAP list serve where prospective workers often advertise as well as farmers looking for help. The same is true of the Carolina Farm Stewardship Association but their coverage is more regional (NC and SC). Our farm gets calls and messages from folks going through the ASAP Local Food Guide which is also searchable on line at the site above. Each farm has a short description which might help narrow your search for hands-on learning more quickly. Fall and winter is conference season and dozens of opportunities exist. Starting with the Organic Growers School go to our site at www.organicgrowersschool.org . The Spring School in March and Fall Fair are some of the best and most affordable educational events anywhere. The CFSA Sustainable Ag Conference is coming up in a few weeks. 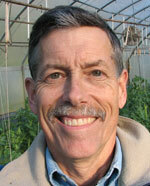 The winter vegetable conference is in Asheville as well as the southeastern apple school. The NC Greenhouse Vegetable Growers Association meets late this month in Raleigh. Most county Extension Agents have a newsletter in their specialty area (e.g. vegetables, livestock, nursery) with upcoming events. For organic, one of the best is from a regional specialist Jeanine Davis. If you are interested in a particular commodity, most crops have an association that puts on some sort of winter meeting. For example the American Holly Society meets in Oak Ridge, Tennessee next month. Warren Wilson College is well known for its sustainable agriculture program, with livestock and garden concentrations. Three land grant universities surround the southern Appalachians, all with organic or sustainable offerings – NCSU, Clemson, and University of Tennessee. Appalachian State in Boone also has sustainable agriculture degrees. These schools may be a long commute but some have done it. Most offer on-line classes as well as classroom experiences. All four offer degrees from bachelors through doctorates. North Carolina has a great system of community colleges. Blue Ridge, AB Tech, Haywood and Mayland all have ag-related programs but one of the most comprehensive is at Western Piedmont Community College in Morganton. Community colleges are also good with specialty topics that farmers need like welding or small engine repair. Web and distance learning resources are nearly endless. Below are a few links to get you started. The OGS “links we like” are listed first. The last one is a new entry by Marc Williams who often teaches with OGS. His site is an on-line based distance learning resource. Not many organic farmers have a traditional agricultural education – a masters in agronomy for example – but I envy those that do. If you have the time and financial resources I recommend that approach. Those that do are usually great farmers. If you don’t have time for a four year degree, consider at least some community college classes. Farming is a second career for me so most of my agricultural education was self-directed. Not growing up on a farm, I found internships critical to my farm education. Carefully targeted workshops and conferences since then allow me to tailor my continuing education to my specific needs based on my farm enterprises and personal interests. I hope to see you at the OGS Spring School in a few short months.